Recessed Thumb Switch for Steam that cannot get knocked loose like earlier models. Heat Shield for your hands keeps them cooler than with earlier models without any barrrier. Note: 220V is special order from Japan and takes 60-90 days to arrive in USA before shipping. A new and exciting steam iron which meets the demands of the twenty first century. Very fashionable steam iron which is proud of its novel mechanism designed, and assures high working efficiency. 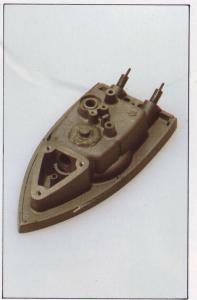 This iron has been developed with easy of use in mind. The temperature can be easily controlled using the thermistor and electric thermostat. 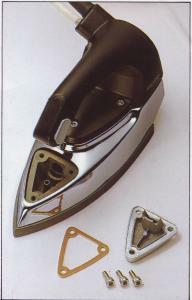 The iron is made from light materials so the user does not become tired. Strong steam output is another of this machine’s special features. As the steam chamber is completely sealed, and the main switch and thermostat are not on the actual iron, durability is insured. Water Bottle and Iron Rest Included! 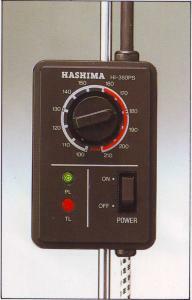 Electronic thermostat are set in a separated box assure accurate temperature control and durability. The cover of the steam generating chamber and the back side of the base can be removed, and unavoidable water impurities closing the steam vent and other foreign objects are easily removed. The steam generating chamber is completely sealed, which improves durability and avoids possible problems.